Many barbeque experts agree that rotisserie, with its consistent temperature and steady rotation speed, produces a better and more consistent flavor than flat grills. 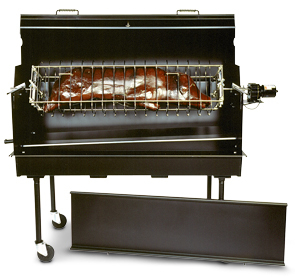 The 56" x 15" spit basket has the capacity to hold a whole pig or lamb up to 150 lbs. The telescoping basket eliminates the need to wrap the pig with that troublesome chicken wire. 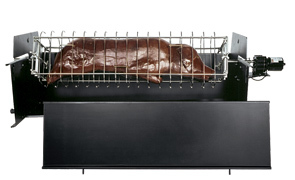 Telescoping from a width of 15" down to 5" accommodates a variety of size pigs, but more importantly can be adjusted, as pig naturally reduces mass, to hold the meat firmly throughout the entire roasting. Model ROTO-BQ-R attachment is designed to easily fit on every steel model PORTA-GRILL® including gas, charcoal, mesquite and pit. Setting the spit basket into the cabinet is made simple by the built-in channels that support and guide the basket into the roller bearing sockets, where it is secured with a locking pin. Removal of the spit basket from the cabinet is also just as convenient. Easy access to the spit basket is gained through the removable front panel. The welded drip pan quickly drains grease from the cabinet. Included in the cost of every ROTO-BQ-R spit basket is a cabinet, drip pan, 110V - 4 RPM motor.